"Besant" redirects here. For Walter Besant, see Walter Besant. For the coin, see Bezant. Annie Besant (Clapham, London 1 October 1847 - 20 September 1933 in Adyar, India) was a prominent Theosophist, women's rights activist, writer and orator and supporter of Irish and Indian self rule. In 1873 she married Frank Besant and moved to London where she became a prominent speaker for the National Secular Society and writer and a close friend of Charles Bradlaugh. In 1877 they were prosecuted for publishing a book by birth control campaigner Charles Knowlton. The scandal made them famous and Bradlaugh was elected MP for Northampton in 1880. Annie became involved with Union organisers including the Bloody Sunday riot and the London matchgirls strike of 1888 and a leading speaker for the Fabian Society and the (Marxist) Social Democratic Federation and was elected to the London School Board for Tower Hamlets, topping the poll even though few women were qualified to vote at that time. In 1890 Annie Besant met Helena Blavatsky and over the next few years her interest in Theosophy grew and her interest in left wing politics waned. She travelled to India and in 1898 helped establish the Central Hindu College in India. In 1902 she established the International Order of Co-Freemasonry in England and over the next few years established lodges in many parts of the British Empire. In 1908 Annie Besant became President of the Theosophical Society and began to steer the society away from Buddhism and towards Hinduism. She also became involved in politics in India, joining the Indian National Congress. When war broke out in Europe in 1914 she helped launch the Home Rule League to campaign for democracy in India and dominion status within the Empire which culminated in her election as president of the India National Congress in late 1917. After the war she continued to campaign for Indian independence until her death in 1933. For a time she undertook part-time study at the Birkbeck Literary and Scientific Institution, where her religious and political activities were to cause alarm. At one point the Institution's governors sought to withhold the publication of her exam results. Once free of Frank Besant and exposed to new currents of thought, Annie began to question not only her long-held religious beliefs but also the whole of conventional thinking. She began to write attacks on the churches and the way they controlled people's lives. In particular she attacked the status of the Church of England as a state-sponsored faith. For many years Annie was a friend of the Society's leader, Charles Bradlaugh. It seems that they were never lovers, but their friendship was very close. Bradlaugh, a former seaman, had long been separated from his wife. Annie lived with Bradlaugh and his daughters, and they worked together on many issues. The pair were arrested and put on trial for publishing the Knowlton book. They were found guilty, but released pending appeal. As well as great opposition, Annie and Bradlaugh also received a great deal of support in the Liberal press. Arguments raged back and forth in the letters and comment columns as well as in the courtroom. For a time, it looked as though they would be sent to prison. The case was thrown out finally only on a technical point: the charges had not been properly drawn up. Bradlaugh's political prospects were not damaged by the Knowlton scandal. He got himself into Parliament at last in 1881. Because of his atheism, he refused to swear the oath of loyalty. Although many Christians were shocked by Bradlaugh, others (like the Liberal leader Gladstone) spoke up for freedom of belief. It took more than six years before the whole issue was sorted out (in Bradlaugh's favor) after a series of by-elections and court appearances. However, Bradlaugh's parliamentary work gradually alienated Annie. Women had no part in parliamentary politics. Annie was searching for a real political outlet: politics where her skills as a speaker, writer and organiser could do some real good. Annie now began to write for the Fabians. This new commitment - and her relationship with Shaw - deepened the split between Annie and Bradlaugh, who was an individualist and opposed to Socialism of any sort. While he would defend free speech at any cost, he was very cautious about encouraging working-class militancy. The events created a great sensation, and became known as Bloody Sunday. Annie was widely blamed - or credited - for it. She threw herself into organising legal aid for the jailed workers and support for their families. Bradlaugh finally broke with her because he felt she should have asked his advice before going ahead with the meeting. Socialists saw the trade unions as the first real signs of working people's ability to organise and fight for themselves. Until now, trade unions had been for skilled workers - men with a craft that might take years to acquire and which gave them at least a little security. The Socialists wanted to bring both unskilled men and women into unions to fight for better pay and conditions. Her most notable victory in this period was perhaps her involvement in the London matchgirls strike of 1888. Annie was drawn into this first really important battle of the "New Unionism" by Herbert Burrows, a young socialist with whom she was for a time in love. He had made contact with workers at Bryant and May's match factory in Bow, London, who were mainly young women. They were very poorly paid. They were also prey to horrendous industrial illnesses, like the bone-rotting Phossy jaw, which was caused by the chemicals used in match manufacture. Some of the match workers asked for help from Burrows and Annie in setting up a union. Annie met the women and set up a committee, which led the women into a strike for better pay and conditions. The action won enormous public support. Annie led demonstrations by "match-girls". They were cheered in the streets, and prominent churchmen wrote in their support. In just over a week they forced the firm to improve pay and conditions. Annie then helped them to set up a proper union and a social centre. During 1884, Annie had developed a very close friendship with Edward Aveling, a young socialist teacher, who lived in her house for a time. Aveling was a scholarly figure and it was he who translated the important works of Marx into English for the first time. Annie seems to have fallen in love with Aveling, but it is not clear that he felt the same way. He was certainly a great influence on her thinking, and she was a great support to his work. However, Aveling left Annie to live with Eleanor Marx, daughter of Karl Marx. This led to permanent ill-feeling between Annie and Eleanor and probably pushed Annie towards the rival Fabians at that time. Aveling and Eleanor joined the Marxist SDF but they distrusted its leader, Henry Hyndman. Soon they left the SDF to join the Socialist League, a small Marxist splinter group which formed around the artist William Morris. It seems that Morris played a large part in converting Annie to Marxism, but it was to the SDF, not his Socialist League, that she turned in 1888. She remained a member for a number of years and became one of its best speakers. Strangely, she was still a member of the Fabian Society. Neither she nor anyone else seemed to think the two movements completely incompatible at the time. Soon after joining the Marxists, Annie stood for election to the London School Board. Because women were not able to take part in parliamentary politics, it is often thought that they did not have any suffrage rights until 1918. In fact, women householders had been brought into the local electorate in 1881, and soon began to make a mark in local politics. Annie drove about with a red ribbon in her hair, speaking at noisy meetings. "No more hungry children," her manifesto proclaimed. She made clear that her Socialism had a feminist side too: "I ask the electors to vote for me, and the non-electors to work for me because women are wanted on the Board and there are too few women candidates." Astonishingly, Annie came out on top of the poll in Tower Hamlets, with over 15,000 votes. Annie wrote in the National Reformer: "Ten years ago, under a cruel law, Christian bigotry robbed me of my little child. Now the care of the 763,680 children of London is placed partly in my hands." Annie was also closely involved in the struggle for the "Dockers' Tanner". The dockers were poorly paid for hard and dangerous work. They were casual labourers, only taken on for one day at a time. Ben Tillett set up a union for dockers. Annie was crucial in this. She helped Tillett to draw up the union's rules and played an important part in the meetings and agitation which built up the organisation. Tillett led the dockers in a fight for better wages: sixpence (2–p.) an hour. Annie spoke for the dockers at public meetings and on street corners. Like the match-girls, the dockers won a lot of public support for their struggle. Even Cardinal Manning, the head of the Roman Catholic Church in England, came out on their side. After a bitter strike, the "dockers' tanner" was won. Given Annie Besant's activity in pursuing the rights of women, humanitarian causes, the mysteries and occult teachings, her interest in freemasonry and subsequent leadership and activism comes as no surprise. She pursued freemasonry with equal vigour when it was mentioned to her that there was a masonry that "accepted women as well as men". She saw freemasonry, in particular co-freemasonry, as an extension of her interest in the rights of women and the greater brotherhood of man and saw co-freemasonry as a "movement which practised true brotherhood, in which women and men worked side by side for the perfecting of humanity. She immediately wanted to be admitted to this organisation", known now as The International Order of Co-Freemasonry, Le Droit Humain. The link was made in 1902 by Francesca Arundale, who accompanied Annie Besant to Paris, along with six friends. "They were all initiated, passed and raised into the first three degrees and Annie returned to England, bearing a Charter and founded there the first Lodge of International Mixed Masonry, Le Droit Humain." "In a very short time, Sister Besant founded new lodges: three in London, three in the south of England, three in the North and North-West; she even organised one in Scotland." Travelling in 1904 with her sisters and brothers she met in Holland, other brethren of a male obedience, who, being interested, collaborated in further expansion of Le Droit Humain. "Annie continued to work with such ardour that soon new lodges were formed Great Britain, South America, Canada, India, Ceylon, Australia and New Zealand. The lodges in all these countries were united under the name of the British Federation." Annie Besant, therefore not only founded the British Federation of Le Droit Humain, of which she was eventually the Most Puissant Grand Commander, she was a major influence in the international growth of the Order - a truly committed freemason and an extraordinary person. Besant was a prolific writer and a powerful orator. In 1889, she was asked to write a review for the Pall Mall Gazette  on The Secret Doctrine, a book by H.P. Blavatsky. After reading it, she sought an interview with its author, meeting Blavatsky in Paris. In this way she was converted to Theosophy. Annie's intellectual journey had always involved a spiritual dimension, a quest for transformation of the whole person. As her interest in Theosophy deepened, she allowed her membership of the Fabian Society to lapse (1890) and broke her links with the Marxists. When Blavatsky died in 1891, Annie was left as one of the leading figures in Theosophy. Her most important public commitment to the faith came in 1893, when she went to present it at the Chicago World Fair. Soon after becoming a member of the Theosophical Society she went to India for the first time (in 1893). After a dispute in which William Quan Judge, leader of the American section, was accused of falsifying letters from the Masters, the American section split away. The remainder of the Society was then led by Henry Steel Olcott and Besant and is today based in Chennai, India, and is known as the Theosophical Society Adyar. Thereafter she devoted much of her energy not only to the Society, but also to India's freedom and progress. Besant Nagar, a neighborhood near the Theosophical Society in Chennai, is named in her honor. She first met clairvoyant theosophist Charles Webster Leadbeater in London in April 1894. They became close co-workers in the theosophical movement and would remain so for the rest of their lives. Besant became clairvoyant in the following year. In a letter dated 25 August 1895 to Francisca Arundale, Leadbeater narrates how Besant became clairvoyant. Together they would investigate the universe, matter, thought-forms and the history of mankind through clairvoyance, and would co-author several books. In 1906 Leadbeater suddenly became the centre of controversy when it emerged that he was sleeping with young boys and engaging in mutual masturbation with them – Leadbeater explained that he had been offering them advice and guidance in order to keep them from sleeping with women. He was forced to resign from the Theosophical Society over this in 1906, but the next year Annie Besant became President of the Society and in 1908 he was taken back into the fold on her insistence. Leadbeater went on to face many more accusations of improper relations with boys, but Besant never deserted him. Up until Besant's presidency, the society had as one of its foci Theravada Buddhism and the island of Ceylon, where Henry Olcott did the majority of his useful work. Under Besant's leadership there was a decisive turn away from this and a refocusing of their activities on "The Aryavarta", as she called central India. Besant actively courted Hindu opinion more than former Theosophical leaders. This was a clear reversal of policy from Blavatsky and Olcott's very public conversion to Buddhism in Ceylon, and their promotion of Buddhist revival activities on the subcontinent (see also: Maha Bodhi Society). Annie set up a new school for boys at Varanasi: the Central Hindu College. Its aim was to build a new leadership for India. The boys lived like monks. They spent 90 minutes a day in prayer and studied the Hindu scriptures, but they also studied modern science. It took 3 years to raise the money for the CHC. Most of the money came from Indian princes. In April 1911, Annie and Pandit Madan Mohan Malaviya met and decided to unite their forces and work for a common Hindu University at Varanasi. Annie and fellow trustees of the Central Hindu College also agreed to Government of India's precondition that the college should become a part of the new University. The Banaras Hindu University started functioning from 1 October 1917 with the Central Hindu College as its first constituent college. As early as 1889, Blavatsky had told a group of Theosophical students that the real purpose of establishing the Society was to prepare humanity for the reception of the World Teacher when he appeared again on earth. This was repeated again more publicly by Besant in 1896, five years after Blavatsky's death. In 1909, soon after Besant's inheritance of the presidency, Leadbeater "discovered" fourteen-year-old Jiddu Krishnamurti on the private beach attached to the Theosophical Society's headquarters at Adyar. Krishnamurti had been living next to the headquarters with his father and brothers for a few months prior to this. 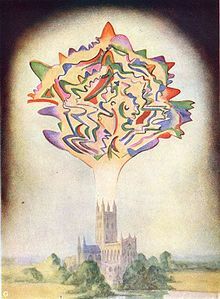 The "discovery" started years of upheaval in the Theosophical Society, as the boy was proclaimed to be the likely "vehicle" for the expected World Teacher. Jiddu Krishnamurti and his younger brother Nityananda ("Nitya") were brought up by Theosophists from that moment on, and Krishnamurti was extensively groomed for his future "mission" as the new Christ-incarnate. The boys were soon placed under the legal guardianship of Besant, following a protracted legal battle with their father. Early in their relationship, Krishnamurti and Besant had developed a very close bond and he considered her a surrogate mother - a role she happily accepted. (His biological mother had died when he was ten years old). In 1929, twenty years after his "discovery", Krishnamurti, who had grown disenchanted with the whole "World Teacher Project", repudiated the role that the leadership of the Society and many Theosophists expected him to fulfil. He denounced the concept of saviors, leaders, and spiritual teachers, and severed his ties with Theosophy. He spent the rest of his life holding dialogues and giving public talks around the world as an unaffiliated individual speaker, becoming in the process widely known as an original, independent thinker on philosophical, psychological, and spiritual subjects. However, his love for Besant never waned, as also was the case with Besant's feelings towards him; concerned for his wellbeing after he declared his independence, she had purchased 6 acres (24,000 m2) of land near the Theosophical Society estate which later became the headquarters of the Krishnamurti Foundation India. Along with her theosophical activities, Annie continued to participate in concrete political struggles. She had joined the Indian National Congress. As the name suggested, this was originally a debating body, which met each year to consider resolutions on political issues. Mostly it demanded more of a say for middle-class Indians in British Indian government. It had not yet developed into a permanent mass movement with local organisation. About this time she lost her clairvoyance, and co-worker C.W. Leadbeater felt called to move to Sydney, Australia. In 1914 war broke out in Europe. Britain needed the support of its empire in the fight against Germany. Annie said: "England's need is India's opportunity," a clear echo of an Irish nationalist slogan. As editor of a newspaper called New India, she attacked the (British) government of India and called for clear and decisive moves towards self-rule. As with Ireland, the government refused to discuss any changes while the war lasted. In 1916 Annie launched the Home Rule League, once again modeling demands for India on Irish models. For the first time India had a political party to fight for change. Unlike the Congress itself, the League worked all year round. It built a strong structure of local branches, enabling it to mobilise demonstrations, public meetings and agitations. In June 1917 Annie was arrested and interned at a hill station. She flew a red and green flag in the garden to show her defiance. Congress and the Muslim League together threatened to launch protests if she were not set free. Annie's arrest had created a focus for protest, giving those who wanted long-term independence for India a chance to work together for a simple, achievable goal. The government was forced to give way and to make vague but significant concessions. It was announced that the ultimate aim of British rule was Indian self-government, and moves in that direction were promised. Annie was freed in September to a tremendous welcome from crowds all over India. In December she took over as President of Congress for a year. It was perhaps the greatest honor she received in her lifetime. After the war, there could be no going back. A new leadership emerged around Mohandas K. Gandhi - one of those who had written to demand Annie's release. He was a lawyer who had returned from leading Asians in a peaceful struggle against racism in South Africa. Jawaharlal Nehru, Gandhi's closest collaborator, had been educated by a Theosophist tutor. The new leadership too was committed to action that was both militant and nonviolent, but there were differences between them and Annie. Despite her past, she was not happy with their socialist leanings. Until the end of her life, however, she continued to campaign for India's independence, not only in India but also on speaking tours of Britain. In her own version of Indian dress, Mrs Besant remained a striking presence on speakers' platforms. She produced a torrent of letters and articles demanding independence. She tried to accommodate Krishnamurti's views into her life, but never really succeeded. The two remained friends, however, until the end of her life. Annie Besant died in 1933 and was survived by her daughter, Mabel. After her death, her colleagues, J. Krishnamurti, Aldous Huxley, Dr. Guido Ferrando, and Rosalind Rajagopal, built Happy Valley School, now renamed Besant Hill School in her honour. The family history onward from the era in which Annie Besant lived became quite fragmented by the late 1940s. A number of Annie Besant's descendants have been traced in detail from her son Arthur Digby's side. One of Arthur Digby's daughters was Sylvia Besant, who married Commander Clem Lewis in the 1920s. They had a daughter, Kathleen Mary, born in 1934, who was given away for adoption within three weeks of the birth and had the new name of Lavinia Pollock. Lavinia married Frank Castle in 1953 and raised a family of five (Besant's great-great grandchildren) - James, Richard, David, Fiona and Andrew Castle - the last and youngest sibling being a former British professional tennis player and now television presenter and personality. Beasant,Annie and Blavatsky, H P - "Memory and Its Nature", Theosophical Publishing House, Madras, ca 1935. ^ "The History of Birkbeck". Birkbeck, University of London. http://www.bbk.ac.uk/bbk/history/. Retrieved 2006-11-26. ^ The International Bulletin, 20 September 1933, The International Order of Co-Freemasonry, Le Droit Humain. ^ Besant, Annie (2 June 1913). "Naranian v. Besant". [Letters to the Editor]. The Times (London). p. 7. ISSN 0140-0460. ^ Blavatsky, H. P. (1889). The Key to Theosophy. London: The Theosophical Publishing Company. pp. 306-307. ^ Wessinger, Catherine Lowman (1988). Annie Besant and Progressive Messianism, 1847-1933. Lewiston, New York: Edwin Mellen Press. ISBN 978-0-88946-523-7. ^ Lutyens, Mary (1975). Krishnamurti: The Years of Awakening. NewYork: Farrar Straus and Giroux. Hardcover. pp. 20-21. ISBN 0374182221. ^ Lutyens p. 5. Also in p. 31 Krishnamurti's letter to Besant dated December 24 1909, and in p. 62, letter dated January 5, 1913.